I first had this at a progressive dinner party for our youth group’s Christmas celebration. It was love at first taste! I instantly fell for the contrast of sweet & salty flavors and creamy & crunchy textures. This can be served as either a salad or a dessert. It’s sweet enough for a dessert, but is also a nice cooling food if you’re serving something spicy. It makes a good compliment to a simple cook-out menu such as brats & burgers, and is a good buffet item. 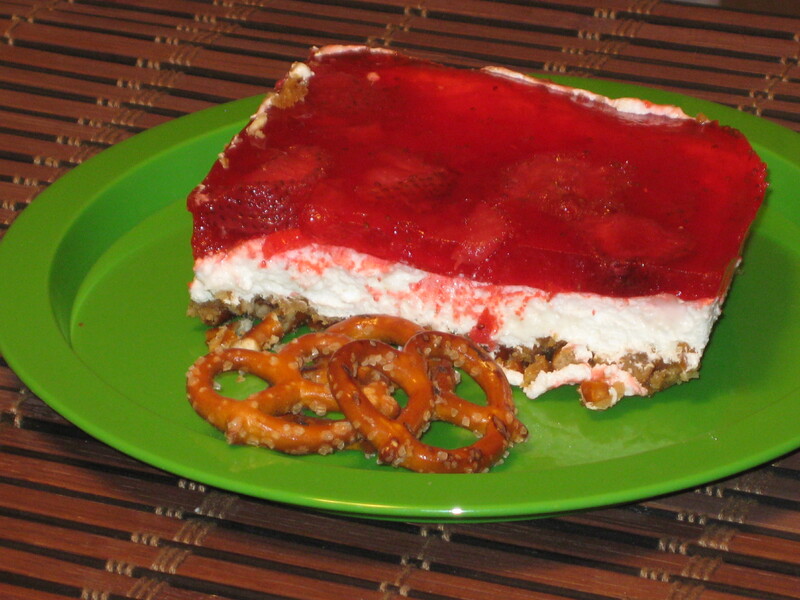 The slightly salty pretzel crust, sweet cream cheese middle, and fruity topping might seem like an odd combination, but it works! Click for recipe. I’ve only made this with strawberry jello and strawberries, but one recipe I found calls for strawberry-banana jello. I’ve been wondering about making it with chopped frozen peaches and peach jello instead of all the strawberries. I’ll have to try that variation one of these days – I think it sounds like a good summer treat! I made this last weekend for a family dinner and was surprised that only my daughter and I liked it. The Cutie Patooties and The Pretty One didn’t want anything to do with it, unless you count TPO scraping the jello layer off the top and eating only that! Once Tish and I got over the surprise of being the only ones who would eat it, we quickly decided that was good news for us — because we had it all to ourselves!